These sweet potato bread, biscuit, crescent, and roll, recipes are sure to please the palette! Bread is a staple of many diets. Who doesn't love bread! Why not make it healthier by adding some nutricious to the delicious with some sweet potato goodness? Try some... Tell us what you favorite is... Share your own favorite recipes. In a large bowl, combine flour, sugar, baking soda, salt and cinnamon. In a smaller bowl, beat eggs. Now add the grated sweet potatoes, oil, pineapple, vanilla, grated orange peel and nuts. Stir wet ingredients into dry ingredients just until moistened. Spoon into two greased and floured loaf pans. Dissolve yeast in warm water in large bowl. Stir in sweet potatoes, shortening, sugar, egg, salt and 3 cups of the flour. Beat until smooth. Stir in enough remaining flour to make dough easy to handle. Punch down dough; divide into 3 equal parts. Roll each part into 12-inch circle on floured surface. 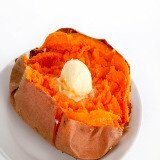 Spread with margarine; cut into 12 wedges. Roll up tightly, beginning at rounded edges. Place rolls with points underneath on greased cookie sheet; curve slightly. Let rise until doubled, 30 to 45 minutes. Heat oven to 400°. Bake until coiden brown, 15 to 20 minutes. Makes 3 dozen rolls. 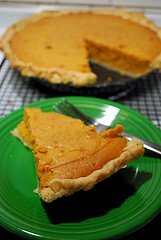 Variation: Pumpkin Crescents: Substitute 1 cup canned pumpkin for the sweet potatoes. Grease bottoms only of 12 medium muffin cups. 2 1/2 x 1 1/4 inches. Beat egg; stir in milk, sweet potato, raisins and margarine. Stir in remaining ingredients all at once just until flour is moistened (batter will be lumpy). Fill muffin cups 2/3 full. Sprinkle 1/4 teasppon sugar over batter in each cup if desired. Bake until golden brown, about 20 minutes. Makes 1 dozen muffins. Variation: Pumpkin muffins: Substitute 1/2 cup canned pumpkin for the sweet potatoes. Omit raisins, if desired, add 1/2 cup chopped pecans or walnuts. 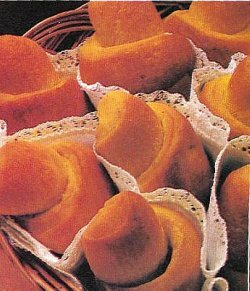 A visitor shares this healthier version for "Sweet Potato Muffins"
Do you have a favorite sweet potato bread recipe? Please share your recipe with us.